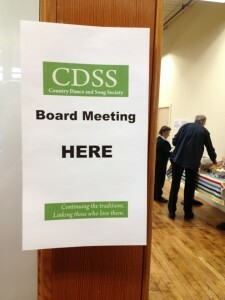 Last Thursday and Friday, April 19th and 20th, the CDSS board and staff gathered in Easthampton, MA for the annual board meeting. When I arrived early on Thursday morning, helpful signs and arrows guided me through the sometimes maze-like hallways of the Eastworks building to a sunny room with seats for 36 and a piano in the corner. Board members from across the U.S. and Canada were enjoying a light breakfast, chatting with staff and unpacking laptops, folders and bars of chocolate. Those who had arrived the day before were discussing the Wednesday night contra dance in Amherst, where some people had gone to dance together before settling in for the meeting. New CDSS Executive Director Rima Dael said she had tucked her 6-year old daughter into bed “dreaming of contra dancing.” The general atmosphere was one of excitement and anticipation. As a staff member who mostly works remotely, I was looking forward to spending two whole days with my co-workers and meeting the board who devote so much energy to our organization. Part of the air of anticipation was certainly due to the fact that the board was welcoming both a new board president and a new Executive Director. New board president David Millstone expressed his joy in welcoming Rima as our new ED by winding up and setting off a toy puppy that did back-flips: “this is how we all feel about having you on board!” There were two new board members at the table as well: Rob Harper, an active dance organizer from the Atlanta area, and Lorraine Lee Hammond of Brookline, MA, who led us all in a song before we began. The song’s refrain, “Swing and turn, jubilee, live and learn, jubilee,” set the perfect tone for the hard work this passionate group was about to tackle. The meeting agenda included some routine business such as budget reviews and approving new policies. There was also some discussion of our upcoming Centennial in 2015, which will bring a host of celebrations, new publications and public outreach. Several rounds of applause were given for the staff, board members and volunteers who have been working for the past several years to facilitate the change in CDSS leadership. Along with an unimaginable variety of chocolates, many cards circled the table throughout the meeting for the board to express its gratitude to those who have helped with this transition. At the end of the first day, interim ED Marie Dalton-Meyer appeared for a thank you party (and endured a rousing chorus of “Marie’s a jolly good fellow.”) Through all this there seemed to be a feeling of empowerment from both the board and the staff. 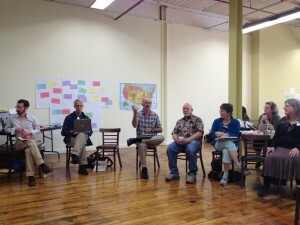 People are ready and excited to look toward the future of CDSS, beyond the transition. At the heart of the meeting were our discussions about major directions for CDSS in the next few years, and I do mean heart. Board members and staff alike come to the table because they are ready to work for something they love. One activity was centered around the question “What do you hope to see in place for CDSS in the next three to five years?” This was where I learned the most about the talents and passions of the board. People listed ideas on half-sheets of paper and transformed one wall of our meeting room into a bulletin board bursting with ideas. It was an honor to spend two days with people who believe the traditions we love can have such a big impact on the world. I can’t wait to live that future! This entry was posted in Governing Board, Updates from the Office on April 24, 2012 by Lynn Nichols. You’re probably familiar with Doug Plummer’s stunning photos of dancers — he documents dance events across the country, showcasing some of his favorite images in his Contra Dance Photo Project Facebook page. He’s now offering a workshop on how to photograph a dance, as part of this awesome camp lineup from our affiliate group BACDS in the Bay Area. Over the course of a week, we will work on how to improve your photos and video of dancing. This is specifically geared to the non-professional, with whatever image-capture device you bring to the camp. If you’ve got a fancy DSLR but don’t know how to use it, fine. If you’ve got an iPhone, great! The gear isn’t the point. The way to deploy it is. We will cover approaches to find the compelling photograph, and not just hope that it finds its way to your camera by accident. The great advantage we have as documentarians is that we are dancers. We know what it feels like to dance, and we are sensitive to the compelling moment. We need to bring that awareness of the dance to the craft of photography. For example—watch the walk-through. Notice where the most interesting moment in the dance is. Now, when the dance starts, watch for that moment. Don’t worry about the rest of the sequence. Find out where you need to stand to make that moment interesting. You’ve got lots of chances to whack away at it. You’ll get a little better each time. If you’ve got a laptop, bring it. We will cover how to edit and process your image files, and how to share them. We will have group critiques, and I will help you improve your shooting. Help bring and end to boring dance coverage. Come to camp. Want to see more of Doug’s dance pics? Check out these three albums and this video, all from our English & American Week at Pinewoods last summer. 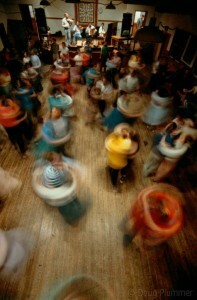 We still have a few of his gorgeous 2012 Contradance Calendar left in our store (now only $10! ), if you have somehow been limping along without a copy of your own. This entry was posted in Camps & Programs, Guest Posts, Ideas & Resources on April 20, 2012 by Lynn Nichols. While roaming around the website for the Association for Cultural Equity (founded by Alan Lomax) I found lesson plans based on collected songs from their archive. Like this one, based on “Fly Around My Blue-Eyed Gal” sung by Hobart Smith. 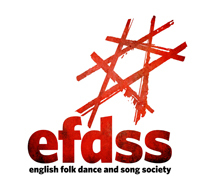 What other online resources do you recommend for classroom teachers of folk music and dance? For offline resources, check out our Teacher Training Course this summer, offered during Family Week at Ogontz by the inimitable Jane Miller. There is still space available in this fabulous course if you act soon! This entry was posted in Camps & Programs, Ideas & Resources on April 12, 2012 by Lynn Nichols. An announcement from our incoming Board President, David Millstone. Folks interested in the history of contra dancing in New England and upstate New York in the post-World War II era may enjoy watching a series of six videos from this year’s Dance Flurry. Billed as “Old TImers Talk” and moderated by incoming CDSS president David Millstone, the panel includes Dudley Laufman and Bob McQuillen, each recipients of the CDSS Lifetime Contribution Award; Ralph Sweet, longtime Connecticut dance caller and leader of a singing squares workshop this summer at Timber Ridge; and Bill and Andy Spence, musician (hammered dulcimer, Fennig’s All Stars) and organizer (Andy’s Front Hall, and founder of the Old Songs Festival). Lots of good stories! This entry was posted in Features & Fun, Guest Posts on April 5, 2012 by Lynn Nichols. This entry was posted in Features & Fun on April 5, 2012 by Lynn Nichols. Recently author and CDSS member Judy Chaves demonstrated the ageless benefits of dancing with the help of members of a retirement community. English country dance made its debut the last week of March 2012 at the University of Vermont’s annual Gerontology Symposium, a gathering for elder service providers in Vermont. 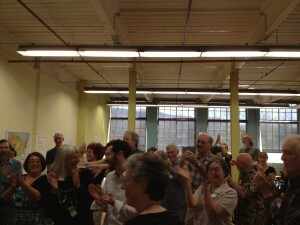 As part of the Symposium’s showcase of “new ideas for engaging elders in social and creative activities,” I gave a presentation on English country dancing (ECD) that included 11 members of the ECD class at Wake Robin, a retirement community in Shelburne, Vermont. This is a group that Val Medve and I have been teaching for seven years and was featured in a Summer 2010 CDSS News article (“Cheers for the Canoneers!”) and formed the basis of a guidebook to teaching ECD to older adults that CDSS recently published (Don’t Stop Calling!). The average age of the group is 82; its oldest member is 91. When I originally approached the organizer of the Symposium with the idea of a dance demonstration, I’d imagined us performing during a break, squeezed into a hallway alongside vendors, hoping to catch the attention of attendees wandering by. So it was exciting to be asked to do an actual presentation in front of the full conference audience. 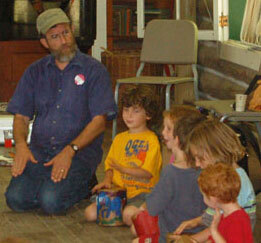 ECD was one of three “new ideas” presented, in addition to fitness hooping and slow yoga. Our presentation began with a brief performance of “Old Wife Behind the Fire.” I then spoke of the many benefits that dance in general has for older adults: physical benefits, like lowering blood pressure and preventing osteoporosis; social and emotional benefits, like prevention of depression and reduction of stress; and mental benefits, like decreasing the likelihood of developing dementia. I also spoke of benefits specific to ECD: its being so very social and cooperative an activity, equally welcoming to individuals and couples, and great for an age group that can often feel isolated. And I spoke of the considerable mental activity ECD entails, the very sort of decision-making that’s been shown to ward off dementia. With the dancers back on the floor, I explained the basic workings of a typical duple minor so the audience could see exactly how these social and mental benefits come about. I explained how the progression causes dancers to engage with everyone in the group, and how it requires dancers to think and make on-the-spot decisions throughout the dance by causing them to execute the complicated patterns continually with new people, in new positions, and in new roles. We then danced a bit of “Portsmouth,” to illustrate the pattern of a hey for three, and, after I explained what a canon is, we danced a couple of times through “John Tallis’s Canon,” to show just how complicated things could get! Any doubt I had as to whether the audience understood what was going on was erased when I later watched the video taken of the group doing the “Canon” at the Symposium, and realized you can actually hear the audience’s delight when the dance begins its second time through and everyone is in the right place, at the right time! Audience questions focused on how to start up such a class: what resources were available; the minimum number of participants needed. I assured them that they’d be able to find ECD folks all over Vermont, New England, and the country (CDSS was listed on their handout of resources), and that most people with ECD-teaching experience would be happy to be invited to take on such a project. Perhaps some of us will get calls! The Wake Robin folks and I drove home from the Symposium feeling elated. Not only had the group totally aced the three dances (“That was awesome!” someone from the audience shouted when “John Tallis” was done), but the delight in the room had been palpable: delight at the dances and music, and delight at the clear potential ECD held for older adults. Gerontology Symposium, held March 20, 2012 in Burlington, VT. Sponsored by The Center on Aging at The University of Vermont. This entry was posted in Features & Fun, Ideas & Resources on April 3, 2012 by Lynn Nichols.